Delta-T - EQ3 - Soil Science - Soil Water Potential - Equitensiometer by Delta-T Devices Ltd. 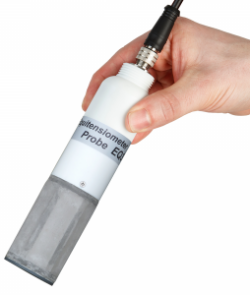 The EQ3 Equitensiometer offers maintenance-free operation over a wide soil water potential range. 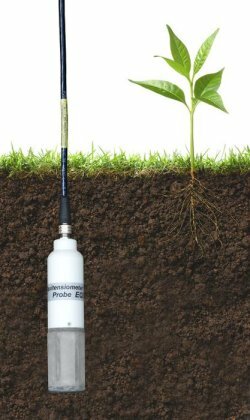 It provides reliable matric potential measurements as well as soil temperature. The EQ3s measuring rods are embedded in a porous material (the equilibrium body). This material has a known, stable relationship between water content and matric potential. When the EQ3 is inserted into the soil, the matric potential within the equilibrium body equilibrates to that of the surrounding soils. The water content of the matric material is measured directly by the EQ3, and this can be converted into the matric potential of the surrounding soil using the calibration curve supplied with each Equitensiometer. The EQ3 is buriable (IP68) and maintenance-free. It can be inserted into augured holes or positioned in the wall of a trench (which is then carefully back-filled). Optional extension tubes assist placement and removal when burying at depth. The EQ3's full range is 0 to -1000 kPa but best accuracy is achieved between -100 and -500 kPa. This makes it well suited to plant water stress studies - even in very dry soils. The EQ3 can be logged by any Delta-T data logger, including the powerful GP2. It is also compatible with many other manufacturers' data loggers. The EQ3 can also be used with an HH2 Moisture Meter, but only the unconverted millivolt output is displayed, and the temperature reading is not available. Note: The DL6 has only one temperature channel. The DL6 error contribution to EQ3 temperature measurement is negligible compared to the accuracy of the EQ3 temperature sensor itself. The two only become comparable below -15C. DL2e Logger users can apply a correction in the Ls2Win logging software (for cable lengths >5m). Reviews have been disabled for Delta-T - Model EQ3 - Equitensiometer.